Once the Queensland Academy of Fitness (QAF) moved their courses online, they quickly expanded to become a national training organisation … they even had to change their name! In 2013 we met and began working with QAF on everything from their website to developing a simple online delivery system. 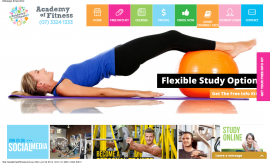 We started with some professional development and then onto their accredited courses and the programs were adopted so well that it has forced closure of their face to face delivery, a name change and released resources for a gym and specialist training area.